The idea of “comfort food” goes back more than 60 years. A Palm Beach Post article on obesity written in 1966 mentions that “adults, when under severe emotional stress, turn to what could be called ‘comfort food’ – food associated with the security of childhood.” Further data say that it’s not foods that are high in sugar or fat that are “comforting,” but rather food that brings a sense of happiness or security, usually related to childhood. This sizzling dish is surprisingly easy to make. It’s also a great compliment to nearly every meal, or if made with enough added ingredients, a meal all by itself. No wonder it makes people feel comfortable, it tastes good and fills you up! The first thing all children learn to make: cold cereal. These bowls of delight are rich in sugar, color, and bring almost everyone back to their childhood…not surprising to see here. It takes years to learn and perfect a good meatloaf recipe, but the benefits are great: full and satisfied bellies, leftovers for lunch, and usually happy memories with the family. It may be a bit more complicated to make than a simple bowl of cereal, but clearly it’s worth it! Whether it’s sprinkled on a salad, wrapped around a steak, or served on its own, there are few things better than a crispy (or floppy depending on your style) piece of bacon to make you forget your troubles and focus on flavor. Bacon is a beautiful thing. A country classic…warm biscuits and gravy. Puts you right back in mom’s kitchen just thinking about it, doesn’t it? This meal is tasty and filling, the perfect combination for anyone with a lot on their minds. If there were a perfect snack that you could eat anytime of the day, quesadillas are it. This classic is served at any mealtime and is loved by many the world over. There’s just something about crispy tortilla, cheese, salsa, sour cream and guacamole that gets the taste buds dancing! This scrumptious dish is akin to the biscuits and gravy above – a combination of two favorites to make a filling, tasty, and comforting meal. It’s just like chicken noodle soup, only without the soup and a whole lot heartier. Baked to perfection, these tasty warm pastries remind everybody of home. Sinking your teeth into one offers a warm, cinnamon-sugary goodness unparalleled in the world of comfort food. Not just cheeseburgers, bacon cheeseburgers. We’ve already mentioned bacon, which should come as no surprise. Now we’re just adding a burger to that. This combo will be around a long time…it was meant to be. Ahh, finally, cheese. Yes, breaded and fried cheese can be quite comforting. Whoever thought to add a marinara dipping sauce to these deserves a Nobel Prize…do they give those out for culinary achievement? There’s nothing like a hot bowl of chili on a cold winter day. Plus there’s so many different ways to make it that perfecting a single recipe is nearly impossible, though always fun. Chili can be spicy, sweet, chunky with meat…even mixed with macaroni for a double-delight. You want a bowl now don’t you? Whether it’s thin crepes drizzled with chocolate or syrupy flapjacks made thick and fluffy, whichever you choose is always comforting. Who cares if they’re filled with sugar and carbs…we’re not thinking about our health right now anyways! The most basic of basics and still one of the best. Even a novice in the kitchen can feel like Gordon Ramsay with a box of pasta and a jar of marinara. It makes us feel good; then, yes, it’s comforting. Sometimes coffee and tea just don’t do it for us. Maybe it’s because coffee reminds us of work and tea tastes thin when we want something thick – or maybe it’s because we have too much of both as it is. Either way, hot chocolate stands alone as the sole drink on this list. Oh how variety makes life worth living! Potato chips are great because everyone, no matter what their tastes, can find a potato chip flavor that’s perfect for them. Lay’s potato chips used to have a saying: “Betcha can’t eat just one.” And after a few decades of thorough first-hand research, we concur. This meal is very similar to meatloaf in that it can take a while to make, but oh boy is it worth it. The traditional recipe has lasted centuries for good reason. There’s almost nothing not to love…other than not being good at making it. These simple sugary pastries can come plain, glazed, filled with jelly, topped with sprinkles, and anything else you can think of. It may be the only food easier than the bowl of cold cereal from above…but that’s because nobody makes donuts, they only buy and eat them. They’re guilty pleasures really, since we know they’re bad for us, but whatever we love them anyway. The crispy meatiness of a perfectly fried piece of chicken, simply put, can’t be beat. 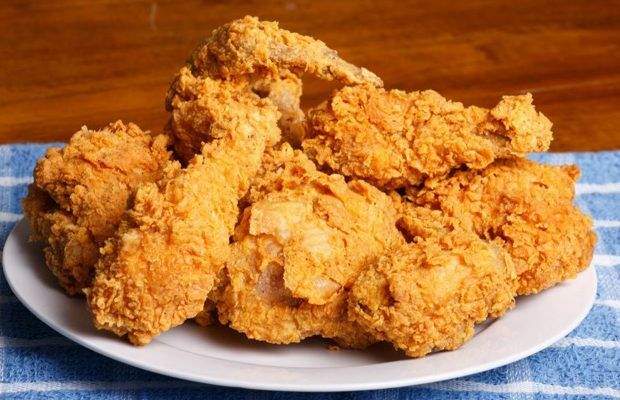 Everyone has their perfect recipe, but there’s nothing better than a simple bucket of American fried chicken…although many cultures make the dish their own, and every kind can be equally comforting. What better side to go with fried chicken than mashed potatoes? Is it a coincidence that people like these two almost exactly the same? There are just too many questions. But it is kind of cool that potatoes are actually enjoyed more than the chicken they’re usually served with…just add butter or gravy and you’re good. So many of these foods are classics. We’ve all enjoyed most of them, and maybe the tradition behind our favorite foods are partially why they’re so comforting. But who are we kidding…cookies are just good. There’s not much more to say. Also called “chips” when served with fish, french fries are almost the perfect side no matter what you’re eating. And who would have thought there would be so many different ways to prepare them? Whether you like the stick-skinny thin-cuts or the fat wedge and steak fries, all forms of the fried side can be thoroughly enjoyable. Oh, you thought we forgot? How silly. We could never forget chocolate. We’ll go ahead and assume that this delicacy tops almost any food list its featured on. There are so, so many things you can do with chocolate. No wonder it’s top five. A slice, a pie, Sicilian, whatever. Everybody likes pizza, not matter if they fold it first or eat it flat. There may be some debate on whether or not you should put pineapple on it, but luckily for us, we can order a pie half with and half without. This one is kind of like the donuts above. There’s a gazillion different kinds and nobody makes it themselves, though all enjoy it. Topped or plain this treat is comforting and there’s no wonder at all it’s number two…but what’s number one then? What? Yeah, the people have spoken: grilled cheese sandwiches are the most comforting food available. If you think about it, it makes perfect sense. They’ve got cheese, are easy to make, can be just a quick snack or a filling meal, and, remembering the opening slide, can brings us back to our childhood. So, which one are you going to have for lunch today?